Capt. Scott Moore, right, has been fishing the Island waters for more than 40 years. 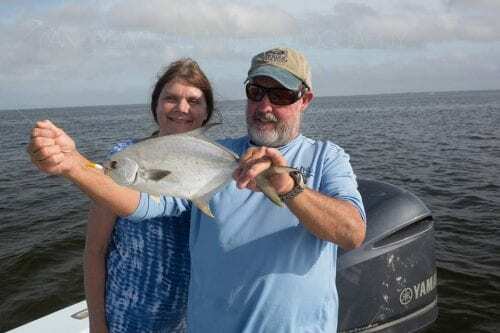 He’s shown here with Judy Holman and a pompano they caught in 2016. ANNA MARIA ISLAND – Local charter fishing captains support the Florida Fish and Wildlife Conservation Commission’s (FWC) executive order that temporarily imposes catch-and-release restrictions on snook and redfish because of red tide. Issued by the FWC Executive Director Eric Sutton on August 30, the executive order applies from the northernmost point of Anna Maria Island in Manatee County to Gordon Pass in Naples and Collier County. Sutton’s order is scheduled for review and additional discussion at the FWC Commission’s Sept. 26 meeting. “I support Eric Sutton’s decision to implement the executive order as we continue to manage this world-class fishery for future generations. We will continue working with our partners and will evaluate next steps at our commission meeting,” FWC Chairman Bo Rivard said in the FWC news release. “We’ve seen the devastation of redfish and snook populations in southwest Florida and we support the catch-and-release initiative taken by FWC,” said Brian Gorski, executive director of the Coastal Conservation Association Florida (CCA). Holmes Beach resident charter fishing Captain Scott Moore has been fishing the local waters near Anna Maria Island for more than 40 years, and he supports the catch-and-release order. “If they limit snook and redfish to catch-and-release for one season, that will give those fish a chance to rebound and it won’t hurt anybody economically. There’s plenty of other fish to eat. We’ve got mackerel, beautiful mangrove snapper, trout and other fish that are eatable. With my customers, we’ll go catch and release a few snooks and then we’ll go catch some snapper and Spanish mackerel to take home to eat,” Moore said. “From Tampa Bay south, the reoccurring red tide has really knocked down the population of snook and redfish. What we want to do is give them a break and preserve what’s out there so they can spawn,” he said. “Snooks, from here south, had significant brood stock snook killed because of the time of the year we had the red tide. In June, they had horrific red tides south of here and it killed those fish that were spawning in the passes. Right now, redfish are going out in the Gulf to spawn, which I’m very concerned about. Redfish spawn in September, October and into November. If that red tide is lying offshore it will kill the brood stock,” Moore said. Local charter Captain Nate Weismann supports the catch-and-release order. “I do not allow clients to harvest snook, and starting about nine months ago, I stopped keeping redfish as well. I just don’t feel good killing these fish given the number of them here locally. Redfish stocks have seemed to decline sharply in the last several years. I would’ve loved to see the FWC extend the emergency closure to trout as well,” he said. Weissman said he’s seen a 75 percent decline in business in August and September due to the red tide. “It literally happened overnight,” he said. Local charter Captain Carson Wooten supports the catch-and-release order. “It’s a positive thing for the fishery in our area. For me, it doesn’t really make a difference as far as it being closed on those two species. I always encourage catch-and-release on my charters anyways, but if they want to keep a couple fish, there are plenty of other fish to keep such as trout, snapper, mackerel and flounder,” he said. Captain Lance Plowman said the catch-and-release order does not impact Cortez Deep Sea Fishing and others whose fishing excursions go much further out in the Gulf.